Janicki Industries (Janicki) has entered into a Memorandum of Understanding with Global Fiberglass Solutions, Inc. (GFSI) for fiberglass recycling and developing manufacturing technologies and processes. Together Janicki and GFSI will collaborate to successfully advance and develop products with a high content of recycled fiberglass materials for use in infrastructural and architectural markets. To implement this partnership GFSI and Janicki will identify market and product potentials for recycled materials and formulate specific material properties for these applications. One of the initial areas of focus will be large scale noise barriers for highways fabricated in part from decommissioned utility scale wind blades. 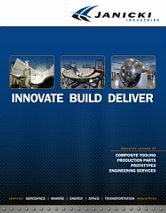 GFSI and their technical partner Washington State University have successfully manufactured a variety of composite products with fiberglass material taken from decommissioned wind blades. Testing conducted for the manufactured products showed overall superior mechanical and physical properties suitable for a whole range of green manufacturing applications. This entry was posted in Press Releases on June 25, 2015 by fdgadmin. Founded and run by engineers, technical capabilities and innovative engineering solutions are the core of our business model. We specialize in designing and manufacturing very large scale, high precision prototypes, tools and production parts. © 2003-2019 Janicki Industries, Inc. All rights reserved. Site Design: FDGweb, Inc.